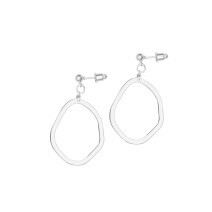 Silver Asymmetric Oval Earrings. Exceptionally modern earrings hang from a sterling silver plated stud. A great pair of day to night earrings, that are sure to get you noticed. Team with it’s partner the Asymmetric Oval Necklace or have them stand their own ground on their own. A great day to night earrings that are sure to get you noticed.